The Loading Sheets option in the Electronic Warehouse Manager is designed to take the place of the printed document (called a "Loading Sheet" in entrée) that is used when picking a specific customers order. When selecting this option, the user must first select a route. 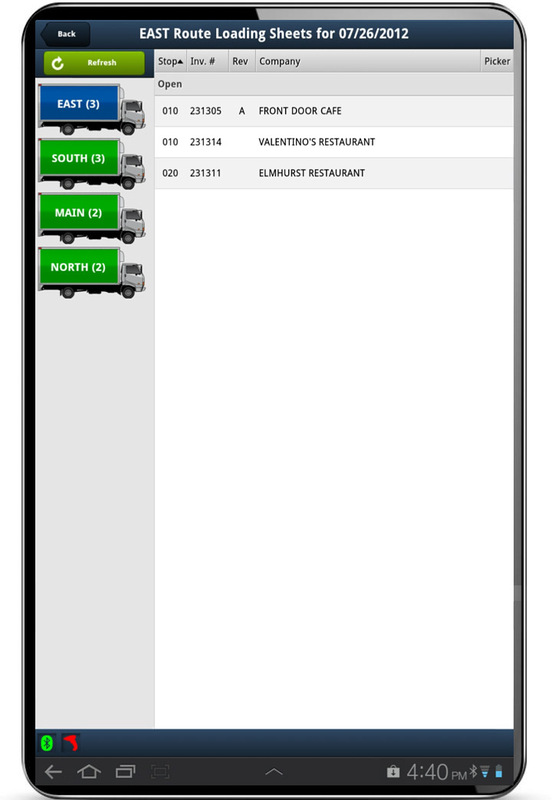 All of the available routes which have orders that need to be picked for the selected delivery date will display, as truck icons. Each of these truck icons are color coded (green, yellow, orange & red) so you can quickly determine how much of the items for that route still need to be picked. Notice also that a number in parenthesis appears next to the name of the route. This number represents how many customer orders are scheduled to be delivered. When the user touches a truck icon, a listing of all the customer orders will appear on the right side of the screen, sorted by Stop sequence. At this point, the user touches the order he will be working on, and the Loading Sheet detail screen next appears. After the user selects a specific customer's invoice from the Route Selection screen, the Loading Sheet screen will appear displaying all the items on that invoice. 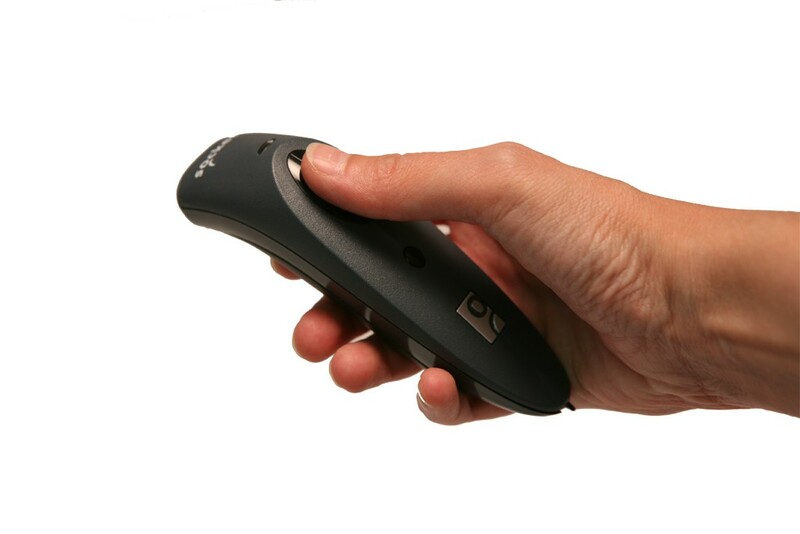 On this screen, the user can view invoice comments, scan barcode labels via wireless Bluetooth barcode scanner, enter picked quantities and catch weights, obtain weights from Bluetooth enabled scale and deal with item substitutions. 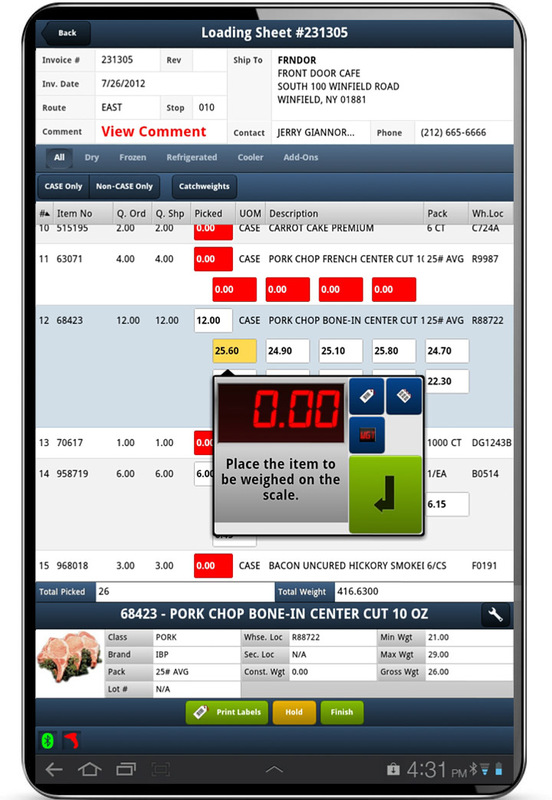 The user can also custom configure the screen to filter items displayed by temperature zone, add-ons, CASE only, non-CASE only and catch weights. They can also sort line items displayed by line number, item number, UOM, description or warehouse location. Shipping labels with customer and item specific information can be printed and affixed to the item as they are picked. There are occasions when an item substitution is required to fulfill a customer's order. For your warehouse user to have this ability the customer must be approved for substitutions and the warehouse user must have the proper authorization. For example, you may set the users setting to only allow them to perform a substitution with a supervisor's verification (by the supervisor entering their password on the user's tablet). When an item substitution is being performed, the tablet will display the defined substitutions or the user can directly scan or enter the item number of the substituted item. This item number will be saved for the next time this item may need to be substituted for the customer. When picking customer orders, your processes may include weighing products on a scale and recording that weight information so that your customer is properly invoiced. For example, your customer might order 25 lbs of fresh salmon fillet. When placed on the scale, the actual weight might be 26.25 lbs. For billing and inventory control purposes, you will want to be sure that the customer is invoiced for the 26.25 lb amount. 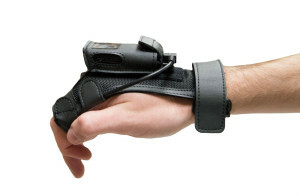 The scale option will allow the user's tablet to be connected to a weight scale via the Bluetooth interface. Most scale company's offer this as option for both new and older model scales. In order to accept the weight from the scale, the user will simply touch the WGT button on the pop-up keypad entry box. The weight from the scale will be displayed on the tablet, and the user will simply touch the large green enter key button to accept the weight. Customer specific Shipping Labels can immediately print per line item as the quantity and/or weights are entered. 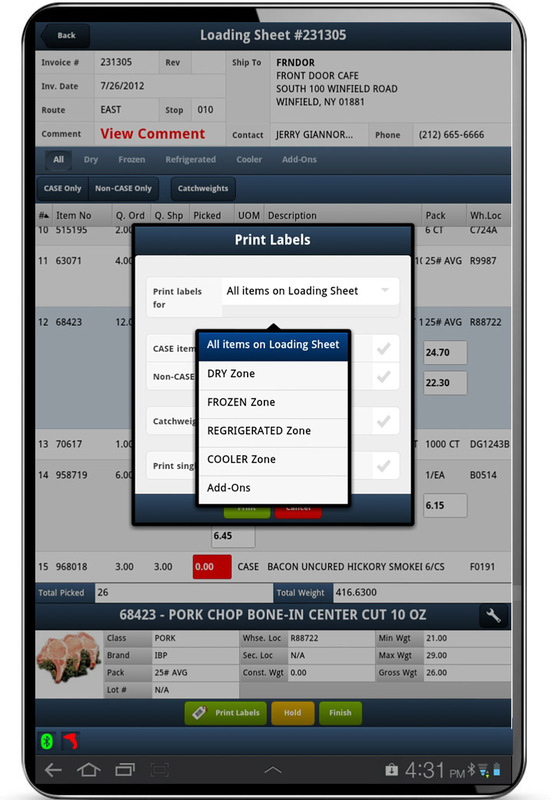 You can also choose to print all the Shipping Labels for the invoice in total at the end of the picking process, with options such as by specific temperature zone (DRY, FROZEN, REFRIGERATED, COOLER), Add-On items only, CASE items only, Non-CASE items only and Catch Weight items only. You can define the labels to print on any of your printers defined on your network. You can design your own label format including your company logo, barcode, etc. via the shipping label designer in entrée. 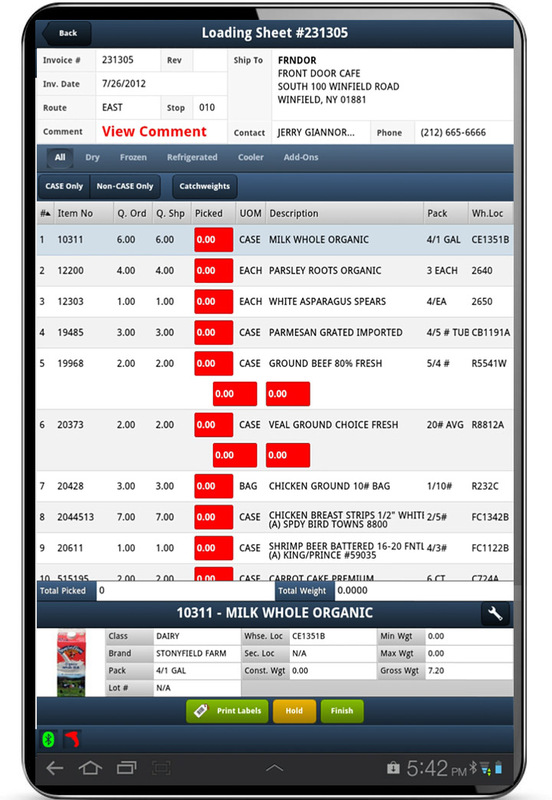 One of the biggest challenges in the order picking process for a food distributor is managing customer add-on's to invoices. Because entrée allows you to easily revise a customer invoice, including adding last minute customer requests for additional items, this can cause picking confusion in your warehouse when using paper processes. Note that each time a customer's invoice is revised, entrée will attach a "revision letter" next to the invoice number. For example, if invoice number 234561 was revised twice with multiple items added, the invoice number will be appear as 234561B. The B is simply a code to show that it was revised two times. The letter C would indicate three times, etc. Pickers using paper may not realize that the add-on's have already been picked, causing double picking errors which waste precious time and resources. Or pickers using paper may not realize that the add-on's were never picked, ultimately causing delivery shortages and upset customers. By utilizing the "Add-Ons" filter on the Loading Sheet screen, the pickers will clearly see what items were added to each revision of the invoice and if those items have been picked. This feature will keep your picking processes working flawlessly and mistake free..